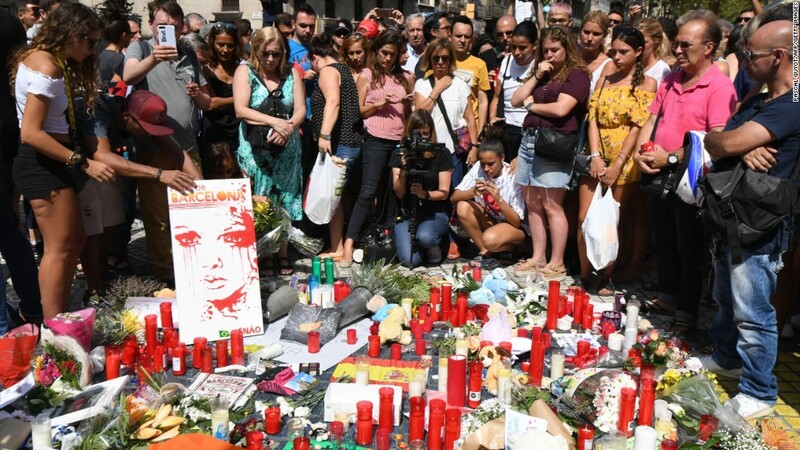 Shares in European airlines and tour operators slumped on Friday after terror attacks rocked Spain, killing or injuring people from at least 34 countries. Five armed attackers knocked down several people with a car before being killed in a shootout with police on Friday in the country's northeastern Catalan region. One woman died after being injured. That attack came just hours after a van drove into pedestrians in the regional capital of Barcelona, killing 13 and injuring around 100 in one of Spain's top tourist destinations. It was the worst attack on Spanish soil since the 2004 Madrid bombings, which killed 191 people. Spain is one of the world's top three vacation spots, alongside the U.S. and France, and has been attracting record numbers of visitors in recent years. As police search for suspects and answers, investors are worried that the latest attacks could deter some tourists. Airline stocks, including Air France (AFLYY), British Airways owner IAG (ICAGY), easyJet (ESYJY) and Ryanair (RYAAY) all fell by more than 3% in early trading. Shares in German carrier Lufthansa (DLAKY) fell by 2.5%. Shares in tour operator Thomas Cook fell by a similar amount. Hotel groups Accor (ACCYY), InterContinental (IHG) and Melia Hotels (SMIZF) began the day with losses of between 1% and 2%. Spain's stock market was among the weakest in Europe on Friday, dipping by as much as 1.5%. Tourism is crucial for Spain, contributing more than 14% of the country's economy in 2016, according to the World Travel & Tourism Council. Nearly 76 million people visited Spain last year, according to the United Nations World Tourism Organization. Barcelona is the country's most popular destination, welcoming about 8 million international visitors a year who stay at least one night in the city. It's most visited site is the Sagrada Familia church, which hosted 4.6 million visitors last year. Barcelona is also Europe's most popular cruise port, according to research firm Euromonitor. It estimated that roughly 200,000 tourists would avoid Spain this year because of the attacks. Until Thursday, Spain had been seen as a safer destination than other vacation spots. France, Turkey, Egypt and Tunisia have all been attacked over the last two years, prompting some visitors to look elsewhere. France as a whole experienced a 7.3% drop in tourism spending in 2016 after a string of attacks, according to the World Travel & Tourism Council. And Parisian officials had to ramp up security and erect barriers around the Eiffel Tower to guard against terror threats. The Louvre museum has seen attendance fall by 21% over the last two years. Shares in American-traded airlines and hotels also dropped late on Thursday after the attack in Barcelona. JetBlue (JBLU) and Delta Air Lines (DAL) were the worst hit, with shares falling by 5% to 6%, respectively.